As of Friday morning, ImpactWrestling.com is only showing eight matches listed for the TNA Slammiversary with a “more to be announced” blurb at the bottom. They usually never have more than nine matches on the card, so expect either a Velvet Sky/ODB match to appear, or possibly something with Generation Me or Mexican America. MATT MORGAN VS. SCOTT STEINER. I’m not sure what management wants to do with either of these guys and maybe it’s better that way. You could justify either guy winning this match, but if the rumors of a new wave of main event guys are true, it would only make sense that a heel Steiner stay on a hot streak. Steiner wins. CRIMSON VS. SAMOA JOE. 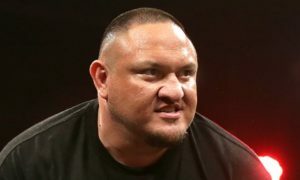 Poor Samoa Joe. Caught up in this winning streak that TNA will undoubtedly carry into the Fall. Crimson takes this and I’d bet the farm. Although outside interference from a new Joe adversary would be welcome here, as to kick off a new rivalry and not bury Joe. BULLY RAY VS. AJ STYLES. Last Man Standing Match. TNA really wants Ray to get over as a monster, and AJ can afford to float around the midcard for a bit longer. I’ve heard rumblings about this being the night that Chris Daniels finally turns his back on Styles, but I’ve got a better heel turn in mind for a later match. Regardless, look for Ray to score a win for Immortal. ABYSS (CHAMP) VS. BRIAN KENDRICK VS. KAZARIAN. X Division Title. I’m sticking to my guns and saying that Abyss is only a placeholder and will drop the belt. But who takes it? After being completely buried a couple of weeks ago, Fortune needs some credibility, so look for Kaz to pin Abyss and take back the belt. MICKIE JAMES (CHAMP) VS. ANGELINA LOVE. Knockouts Title. This match should be stellar with all the makings of Winter trying in earnest to assist Angelina in her win. Mickie is prominent, and she can win back the title in a few months, but I think Angelina wins to strengthen the somewhat intriguing saga between her and Winter. JEFF JARRETT VS. KURT ANGLE. If Kurt loses, he forfeits possession of his Olympic gold medal to Jarrett. They briefly mentioned that this was essentially a number one contender match for the World title and Kurt is in far better position to fight for it at this juncture. In a happy ending, Kurt Angle wins and Karen Jarrett is deported to Colombia. “GUN MONEY” (CHAMPS) VS. THE BRITISH INVASION. Tag Titles. This all depends on whether you believe Robert Roode is legitimately hurt, which seems to be eluding me at this time. In an effort to shoehorn Alex Shelley in and keep him happy, I’ll say Roode is acting, which means there is more to this story in the future. The British Invasion have absolutely nothing going for them other than that four corners win at TNA Lockdown. Look for James Storm to get back on his feet and pin someone to represent Beer Money. STING (CHAMP) VS. MR. ANDERSON. World Heavyweight Title. I’m calling Mr. Anderson‘s heelish ways as a witty red herring for Sting to turn and join up with Immortal. Think about it, the Sting farewell tour continues, it gives the company a strong, established, main event bad guy, and sets the stage for what should be a great feud between Kurt Angle and Sting. Sting retains the belt and Anderson begins a feud with someone like AJ Styles, Crimson, or Gunner.